Please allow me to introduce myself. 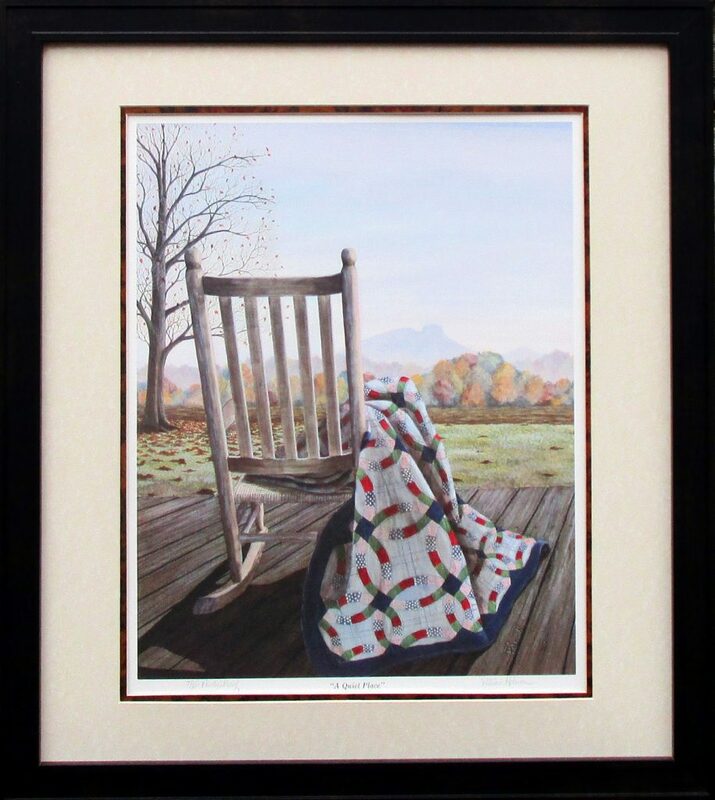 I am a self-taught artist and life long resident of the foothills of North Carolina. My artwork is very realistic. Some folks even say they feel like they could walk right into each scene. The paintings I have done span a wide variety of subject matter, from still life to seascapes and are available as original paintings and limited edition prints. There is something for all your decorating needs. I was born January 16, 1953 in Yadkinville,NC. My mother was a school teacher and my father was a fertilizer salesman. Four years later my sister Jean was born. Since childhood, I have enjoyed the many aspects of the gift of creativity that I was born with. Even at that age, I wanted to create my own visual world. My first noted honor came for a picture I did at the age of ten. In the scene I depicted a mare and her foal in a stable. After winning honors here in NC and the USA, this piece was part of a European tour called “Young American Art” and now resides in the department of archives in Raleigh, NC. During my early years, I always loved making and creating things. Even though the arts were my passion then, my mother strongly urged me to take all college preparatory classes in preparation for college. You see, my mom was a teacher and had a good salary, for a woman, back when most women were stay at home mothers. And, it was a good thing. Because approximately a week after my twelfth birthday, our dad left our mother to raise my sister and me by herself. She was a strong woman who pulled herself together and did a darn good job and always put us ahead of herself. It was her hope that my sister or I would never be in a situation like hers without the tools to take care of ourselves. Well, I was cruising through high school with all of those college courses and was ask out for my first date in the winter of my junior year. It just so happened that my date had previously wrecked his car and our night out was with another couple. I don’t think either of us were feeling a lot of chemistry but he did ask me to go out again with him and the other couple. Later, looking back on the two dates, most of the conversation was between the other guy and myself. My date and his date hardly said more than a few words either time. Then, the Sunday afternoon after that last date, The other guy called me up. We were talking on the phone until Mother said she needed it. So, I said “You want to come over.” He said “Sure. I be there in a little while.” The rest is history because that other guy was Felix Hobson. Prior to those infamous double dates, Felix and I had hardly said more to each other than “Hi” in the hall at school. But, suddenly we were inseparable. We could sit and talk for hours about anything. It was like we had known each other all of our lives. I learned all about his family dairy farm and how he had been working for his dad for pay from a very early age. 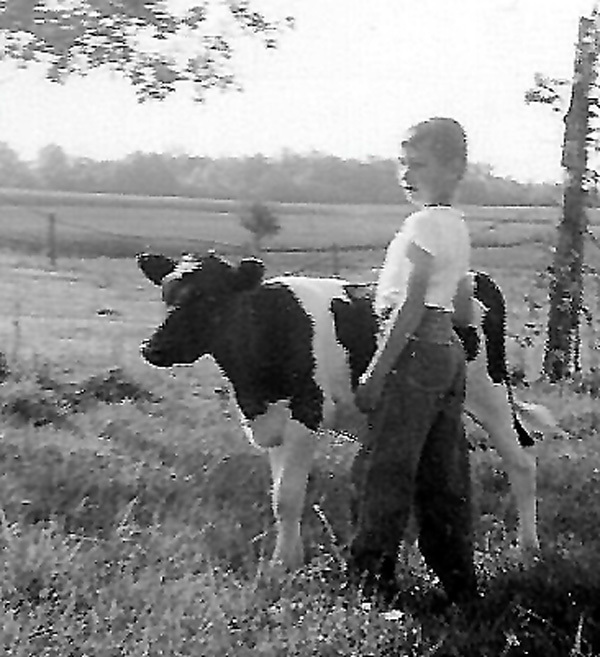 His dad put him to milking the cows at the age of nine. From that point on, he milked the cows and did other chores every evening after school. I’ll never forget the story he told me about his dad putting him in the dump truck at the age of twelve and had him hauling silage from the field to the silo. Felix is not a tall man. And, you know that boys height comes on at a later age. He said that he could barely push in the clutch, and when he did, he slid so far down in the seat that he could not see over the dashboard. He was literately scarred to death but he made it through with flying colors. Eventually, he used some of the money he had saved and bought himself some cows of his own. Then, when he turned sixteen, he bought his first car and paid cash. Young Felix on the farm. We started dating in march. 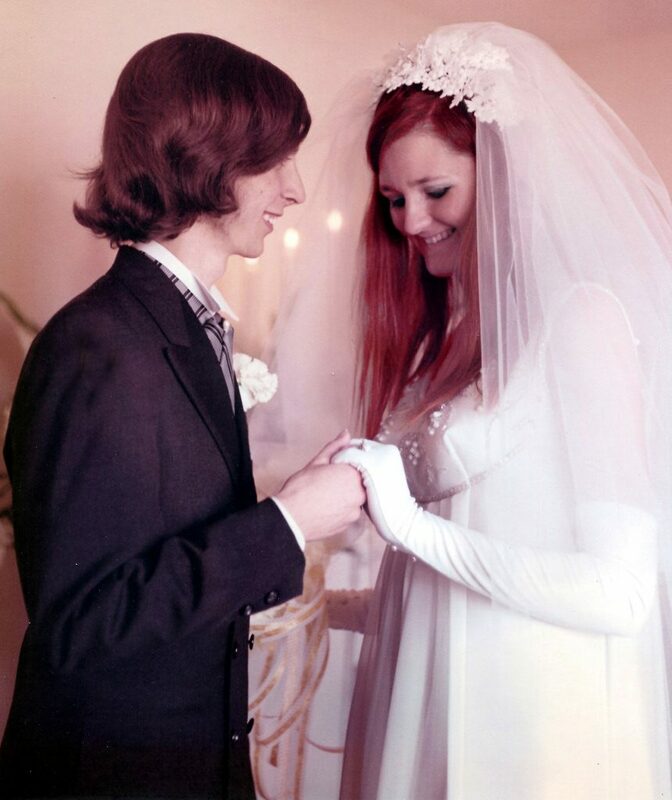 Within a few weeks, we were talking about getting married. He never ask me. I never ask him. It was as if it was meant to be. In May on the night of our junior prom Felix gave me a pre-engagement ring. It was small. But, to me, it was a huge rock. The following summer was a fun one. Felix would come get me and take me back to the farm some days. I would ride with him in the silage trucks while they were cutting and stay with him while he milked the cows. He would hit the shower to clean up then take me home. The following Christmas Felix gave me a beautiful engagement ring. And, we announced that we were planning to get married in June after graduation. Unfortunately, during that time, my mother was having a hard time with our plans to get married. Her whole life, to that point, had been Jean and me. Our father had left her. Now, I was going to be leaving her too. Things finally came to a head in March. Felix and I made the decision to go ahead and get married. 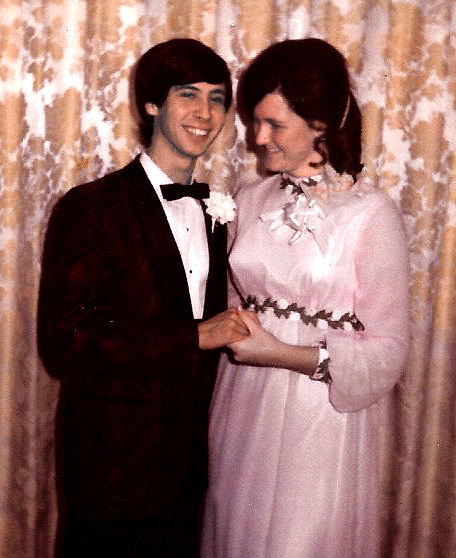 So, on March 27, 1971, I married my high school sweetheart and moved to the dairy farm where he grew up. There’s more good news. After I left home, my relationship with my mother recovered. My mother and sister were at the wedding. And from that point on, we never had another cross word with each other till the day she passed away in May of 2004. I miss my Mother. 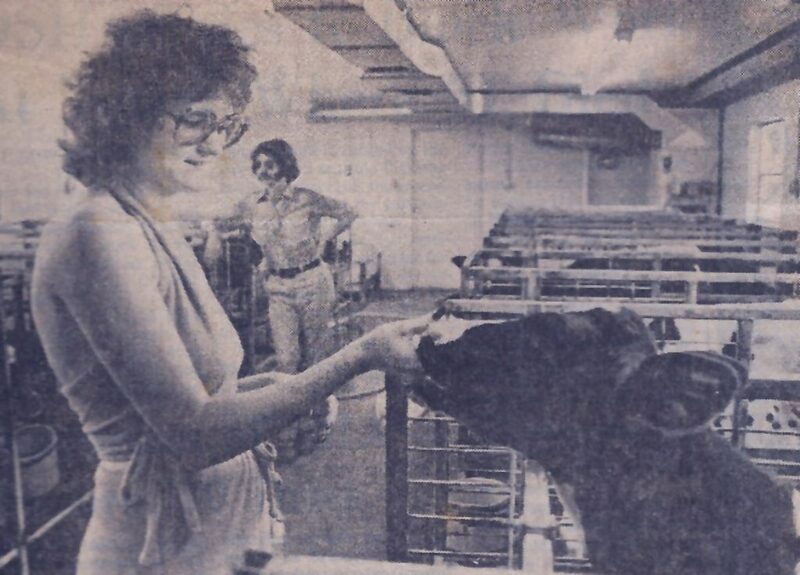 Living on the farm and working with the animals was an adventure for me. We had decided that the farm is where we would stay. Felix would commute to Wake Forrest University and partner with his dad in the dairy business. My plans to do the college thing and become a pharmacist weren’t going to happen. Felix and I were both accepted to Wake Forest University. But, there was no way that we could pay for both of us to go to college. You know, I truly believe that God had a plan for each of us. My going to college wasn’t in the plan for me. I always knew that college would be much easier for Felix than me. I had always had problems reading and did not know until after I was married that I was dyslectic. All the way through school, I had certainly made really good grades. But, I had to struggle and work so much harder than other kids in my class. I rarely ever finished reading books at the deadlines and was never able to complete those timed state test and college boards. So the decisions were made. 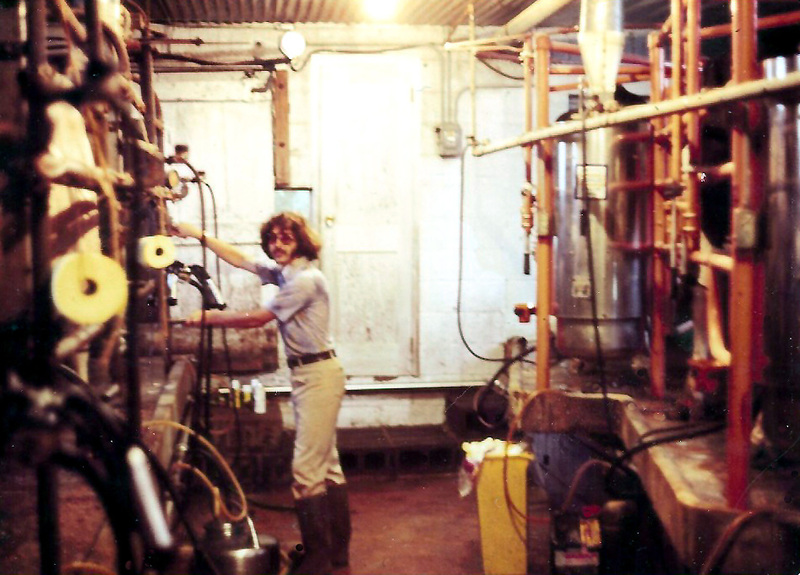 Felix would milk his way through college while I stayed at home and worked with him on the farm. To be quite honest, I was relieved because I was terrified of going to college anyway. There, I said it! Little did I know that would be one of the best decisions that I would ever make. I was so happy working along side of Felix on the farm. All the care of the baby calves was my responsibility. Even thought that job meant working outside on days that could range from freezing cold and rainy to broiling hot and dry. I couldn’t have had a job at that time that I enjoyed more. I guess it was the motherly instinct coming out. We actually received recognition in NC for the quality of our dairy farming practices. The excellent care that we gave our calves including the large number of calves we were able to to raise from birth was a large factor in our winning the honer. 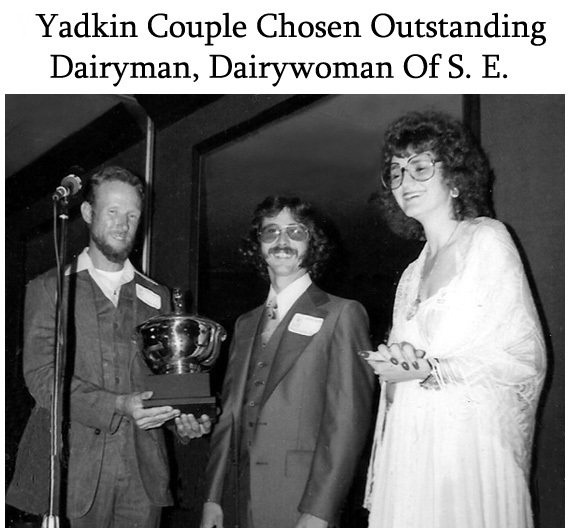 We were actually named Young Dairyman & Dairywoman of the Southeast US in 1978.Since I was not attending college, Felix encouraged me to pursue my artistic talents. I had always wanted to paint. So I dove right in. I loved acrylic paints even then. But, my style and subject matter was completely abstract. Most of my paintings were done just using the primary colors the brighter the better. Yes as you might assume, I was and will always be one of the original “Hippies” with flowers in my hair and all. As time would have it, in October, 1976 I gave birth to our first child. Her name was Natalie. Even with a new baby, I still found the time for my painting and began to incorporate a bit of realism here and there. 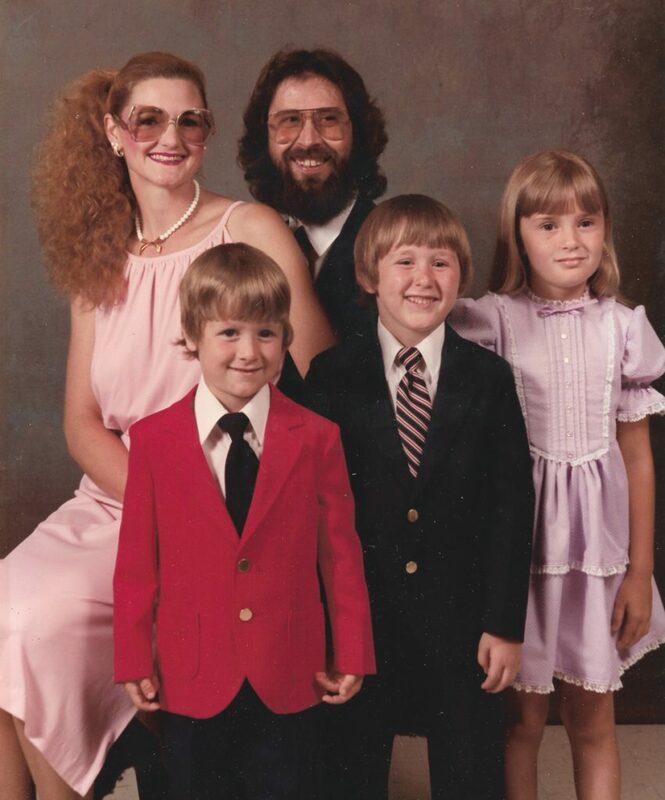 Then in April of 1978 came our first son, Nathan. Two babies began to put a strain on my ability to crank out the artwork. In August of 1979, our youngest son was born. We named him Julian. I never dreamed that he would be our last child. We had always wanted a large family but that just wasn’t meant to be. All my later pregnancies ended in miscarriage. At that time I chose to put the brushes and paints in the closet to be able to for fill my motherly duties with the proper attention I felt necessary. Motherhood is God’s highest calling. Your children are only young once. But, you can make money your whole life. As our children grew into their teens and no longer needed all of my attention, I pulled the brushes, paints and canvas out of the closet and began to paint once more. By this time my interest had changed to capturing the beautiful scenes of the world around me. Having our three children and living on the farm had given me a love of life and nature that I felt I needed to put on canvas. Everywhere I looked, from seeing a newborn calf in the barn to a historic village, I saw a potential painting. My desire to paint was even greater now than ever. When our youngest child went off to school, I suffered from empty nest syndrome as many mothers do. Felix knew how I loved making works of art and encouraged me to pursue my dream of being an artist. My friends and family started telling people about my work. The first place that I displayed my paintings, believe it or not, was in a local beauty shop. I sold several pieces and started doing commissioned paintings. This art print would be my humble beginnings of realistic landscape painting. After all, it was my first attempt at painting a building. Boy, have I come a long way! The piece was painted, prints made and ready to sell in 1988. At that time, I had never tried to market my work on that large scale before. So, I just naively thought that since I wanted to restore this house all my friends and anyone who was related to the Hobson family would want to purchase a print and support the project. Needless to say, I was wrong. We did sell a few prints and were able to make some repairs to the place then the interest faded. We have over the years tried to keep the house from going into further disrepair. Thankfully, at the time of this writing, interest in this print and the restoration project seems to be coming back little by little. I do pick at my children saying, “When I’m gone, everybody might want one of my first prints. So, you guys may finely get the old house restored.” Of course they reply with “Oh Mama. !” All kidding aside, sales of this print are appreciated and we are still using the profits to keep the house repaired. Unfortunately, the house now needs more love than we have been able to give at this time because of the medical expenses that we have incurred due to my illness and being in a wheel chair. In 1989, I was invited by two local galleries, one in Elkin, NC and one in Winston Salem, NC, to sit one day a week and paint giving me the opportunity to meet and share my artwork with more people. Now, from the time of picking the brushes back up, I had a waiting list of so many people desiring one of my creations. And as time moved on, I quickly realized I could not do enough original paintings to satisfy the need. I also realized that not everyone could afford an original painting either. I needed to seriously consider doing limited edition prints again of my more popular pieces. So, in late 1989, my second limited edition was released to the public. The subject of the painting was an old country store in a little historic village near my home, called “Rockford”. From that point, I had prints and original paintings in most of the art galleries in the Piedmont area of NC. I was a very busy woman by then with a booming art career and attending my kids high school events. Not only did the prints allow more people to acquire my work, they were an opportunity for me to broaden my base of popularity. As my career moved forward, in 1990, I did a painting and prints of the historical Bethabara Church that stands in the Moravian village of Bethabara in Old Town, North Carolina. In the winter of 1991, I finished my first painting featuring a street in the historic village of Old Salem, NC and named it “Salem Radiance.” I sold it to a collector of my work who was urging me to have it printed. On the evening of my birthday, January 16, he invited me out to dinner to discuss having it printed. I will never forget that evening and not for the reason that you are thinking. He had offered to help me finance and market the prints of the Salem piece which was great. And, just as I had agreed to do it, our waiter came to the table with some bad news. He told us that President George H. W. Bush had announced the start of our first Gulf war. It would be called “Operation Desert Storm.” Here it was my birthday. I had some one besides family that was willing to help promote my work. But, the thing on my mind at the end of that evening was all those young men and women would be leaving home and shipped out to the middle east to fight a war. When spring came, I released the prints of “Salem Radiance.” It turned out to be the best selling print that I had done to that point. Over half of the prints were sold within a month! When 1995 rolled in, I designed and purchased a beautiful mobile home that would be setup here on the farm. It would be my studio, retail gallery and frame shop. I finally had a place where people could come visit me here on the farm, purchase my artwork and have it framed all in one place. The weekend of the grand opening could not have gone better. Literally hundreds of people came including folks from as far away as northern Virginia and South Carolina. In the fall of 1998, our youngest child went off to college. Boy, if I ever needed to sell artwork, it was then. We had three children in college at the same time. So, Felix retired from the dairy business. We purchased a motor home and went on the road doing art shows all over the eastern US. In that same year, I was presented with the North Carolina’s Governor’s Award by the honorable James Hunt, governor of NC, for my contributions to charity and my help for the less fortunate in our state. 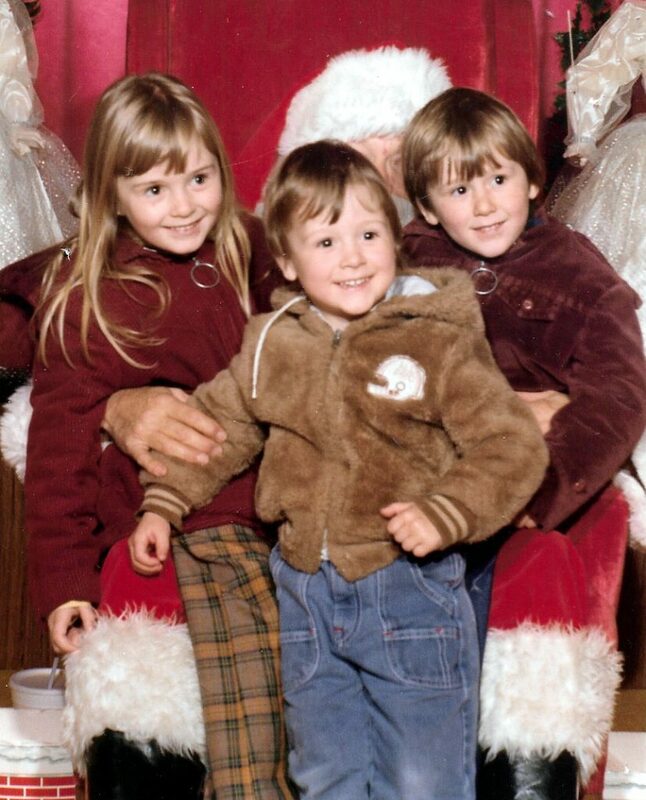 By 2003, Felix and I were still doing shows on the road, our daughter had gotten married and all three of our kids had moved to various parts of California. Due to some unfortunate health problems in January of 2009, I became unable to travel the country showing my work. I was stricken with a strep infection in my spine and blood stream. Suddenly I had a fever of 103.5, was in excruciating pain and unable to walk. After almost one month in the hospital, I finally began to take a few steps at a time with a walker and was discharged from the hospital. For another six weeks at home, Felix had to give me IV antibiotics twice a day. Weeks passed. The infection was finally eradicated but my back continued to deteriorate to the point that that pain was once again too much for me to walk. 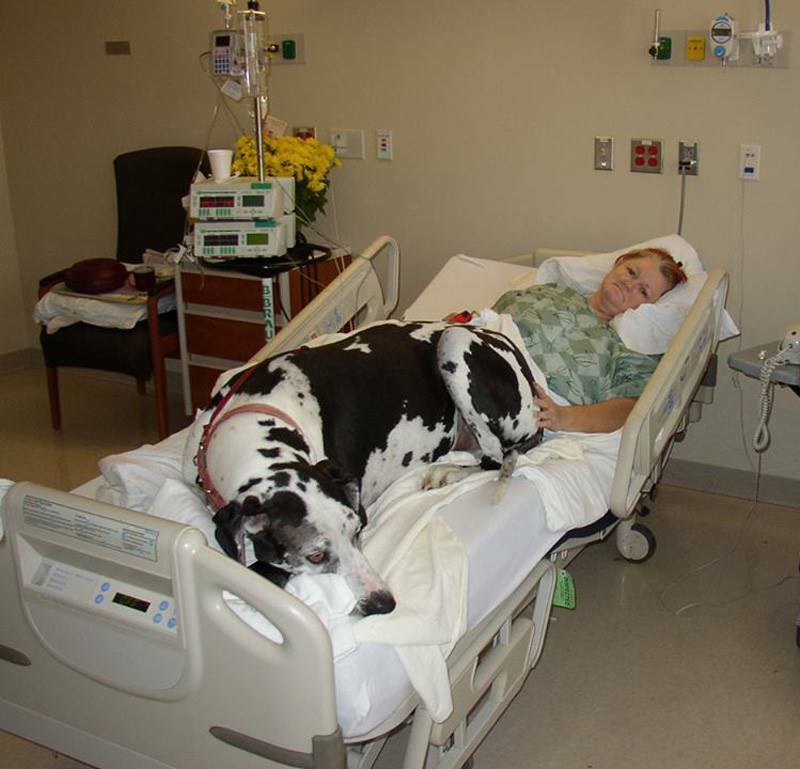 I was in the hospital for so long that, they let Felix bring my Great Dane, who we called “Goober,” to visit me for a day. I’m not sure who was the happiest him or me. I was admitted to the hospital again to learn that the infection had totally eaten up two discs in my back and destroyed the vertebra between the two. After a serious surgery of reconstruction, I could stand and walk a few feet at a time. For the most part though, I still have to use a wheelchair to get around. 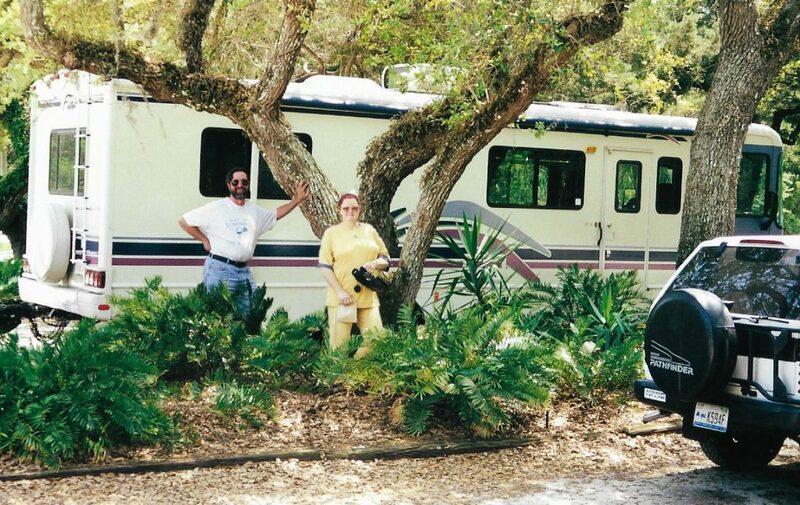 As a result, we decided that we needed to park the motor home and hit the “Information Highway.” So, with the help of an online class, I taught myself how to build websites, built a new updated site and made a push to show my artwork to more people via the internet. It was two years after the surgery before I could sit long enough to paint or sculpt again. I’ll admit that during the past ten years I have suffered from depression from time to time. I can’t imagine if anyone who has gone through such an ordeal would not have had at least some depression. Since the release of that print, I have once again taught myself another even newer system of building websites, called WordPress, and have built this newer much improved site that is being debuted on March 27, 2019. That day is Felix and my 48th wedding anniversary. We all know that the road of life often has bumps and curves. It’s the way we chose to navigate our road that reveals our true character. As for me, I’m not going to let my inability to walk keep me from using my God given talent of painting this beautiful world. While I continue to put paint on canvas, I hope you will continue enjoying my work and tell your family and friends about me and send them to my website. Thanks for caring and enjoying my artwork!